Tired of losing your cell phone? Of having other people listen in on your conversations? What about all the times you've had to turn it off at public events, or leave it behind while swimming? Two British inventors have unveiled a prototype of a device that could solve those problems. 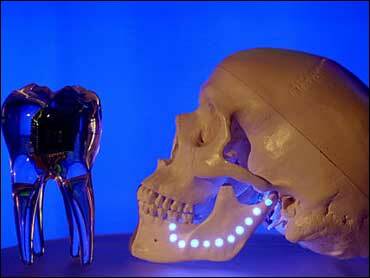 But there's a drawback - your dentist would have to install it inside one of your molars. Unofficially known as the "telephone tooth," the device would allow you to receive phone calls, listen to music, even connect to verbal sites on the Internet without anyone else hearing a thing. "It felt strange. It was weird," said 8-year-old Caitlin Caddies, who tried the prototype at the Science Museum in London. "But I'd be delighted to have it if it would allow my friends to call me at night while I was in bed without my parents knowing. "Would it hurt when the dentist put it in?" she asked. James Auger, 31, and Jimmy Loizeau, 34, developed the device while enrolled in a master's program at the Royal College of Art in London on the way technology is used today. So far, no company has announced it is making the device. But Auger and Loizeau have moved to Dublin, Ireland, to work with Media Lab Europe, the European research partner of the Massachusetts Institute of Technology Media Lab. Theoretically, the device would allow spies to receive instructions secretly, or athletes to hear from their coaches while on the field. Other beneficiaries could include investors and brokers, and sports fanatics who want to be informed the moment their team wins or loses. However, the device, also known as the "molar mobile," does not allow people to talk back to callers or make outgoing calls. Auger said the "telephone tooth" is just another device designed to help people better cope with existing technology: like the flight suits developed to allow pilots make tight turns in high-speed warplanes without blacking out. The "telephone tooth" would place a small device in a person's back molar that includes a wireless, low-frequency receiver and a gadget that turns audio signals into mechanical vibrations, which would pass from the tooth directly to the inner ear as clear sounds. The user also would keep a tiny device outside his body to turn the cellphone on and off and to program it. On Friday, people lined up at the Science Museum to try out a prototype of the "telephone tooth," which is officially known as the audio tooth implant. The crude imitation of the device included a walkie-talkie and a plastic cocktail stick that users placed in their mouths to receive vibrations in their molars. Reactions ran the spectrum from fascination and consumer interest, to fear of the dentist and horror about surrendering personal privacy. "The sound was surprisingly clear, but 10 years from now we'll probably find out that the phone implant causes throat cancer," said Kiaron Hunt, 25, a tourist from Sydney, Australia. "But I guess we're heading for a high-tech world where everyone's on the go all the time. Maybe we won't be able to do without such tools." Jane Biglin, 44, from suburban London, said she loved the quality of the sound, but it seemed odd she couldn't talk back. And even though the device would allow her to talk to her husband in private over the noise of their kids, Biglin said she wouldn't want anything implanted in her mouth.